Just about every electrical engineer and technician has a DMM on their bench. They are used for their high resolution and high accuracy voltage, current, and resistance measurement capabilities. One capability that most high performance DMMs have that users are typically not aware of is their low frequency digitizing capability. In this post we will look at combining a DMM's high resolution measurement capability with its digitizing capability to create a Low Frequency Analyzer (LFA). We will also look at some free software for performing LFA functionality with a DMM. Measuring total harmonic distortion on power line signals. Click here to check out an article on this application. The challenge is there is no useful way to analyze the digitized measurements on the DMM itself. To make the digitized measurements available for analysis we have to pull them off the DMM and post process them. If we want to use our DMM as LFA that post processing includes performing a Fast Fourier Transform (FFT) on the measurements so we can view the signal's frequency components. Let's use Agilent's 34411A high performance DMM as our example DMM we want to use as a LFA. The 34411A provides two ways to access its digitizer functionality and retrieve the readings. The first is using its LXI web interface via a LAN connection to the instrument. This method provides the advantage of needing no custom software. All you need is a web browser. There is a past GPETE post that shows a video using the 34411A as a digitizer via its LXI web interface. To check out the video click here. Once you have the readings from the web interface you can then transfer them to a program like Excel for FFT analysis. Click here to learn how to do FFT analysis in Excel. The second way is to use custom software to connect to the 34411A, set it up as a digitizer, retrieve the measurements, and analyze them. Popular test and measurement software environments like Matlab, LabView, and VEE provide instrument drivers, FFT libraries, and plotting capabilities to make this easy as possible for experienced programmers. But if your not an experience programmer or you just don't have time to put together some custom software, I created two free programs that allow you to use the following DMMs as low cost LFAs: 34411A, 34410A, and the L4411A. Both programs use LAN to connect and control the DMMs. The first program is based off of Matlab and is entitled "Dynamic Signal Analyzer 34411A." It can be downloaded from Matlab Central (link: http://www.mathworks.com/matlabcentral/fileexchange/35161). 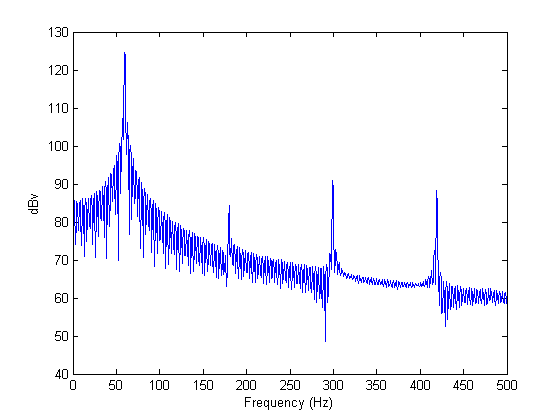 As an example I used Dynamic Signal Analyzer 34411A to capture a 60 Hz power line signal for analysis using the 34411A. 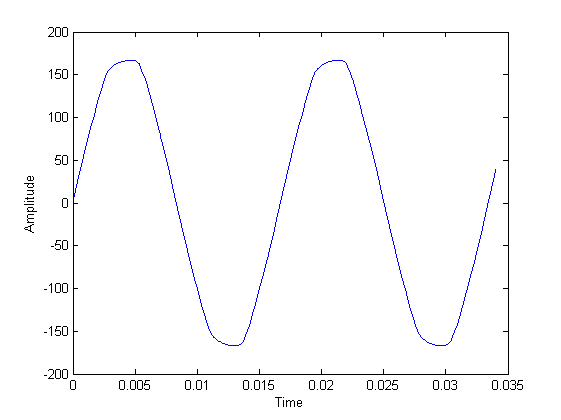 The resulting frequency domain and time domain plots from the program can be seen below. The second LFA program was done using Agilent VEE and it is called "34411A LFA." The great thing about VEE is you can run a VEE program without using any for pay software. All you need to do to run a VEE program is to download its free run time environment. If you are interested in the VEE program just shoot me an email, tell me about your application, and I will send you the program with some instructions (neil_forcier@agilent.com). Keep in mind that both of these programs are offered "as is" and are not supported by Agilent (just me). In this post we talk about how high performance DMMs, with their high resolution and digitizing capabilities, can be used as a low cost LFA. We talk about how we can access the digitized measurements for post processing and analysis. Finally we looked at two free programs available to you for using the following Agilent DMMs as LFAs: 34411A, 34410A, and the L4411A. If you have any comments or personal experiences to add to this post use the comments section below. Our programming assignment are really helpful for the students and can be us easily. I have to say that after reading your blog post, I had so much to learn and would like to read more of your articles in the future.You have an expertise way of writing your articles ,making them interesting to read. As a postgraduate when you are doing your research and you have been stuck on writing your literature review chapter, get our reliable Literature Review Chapter Writing Help from our skilled experts and be assured to get a top-notch literature review paper.